Another of the creatures we encounter at the cabin is the pack rat, otherwise known as the wood rat or desert wood rat. These are the cutest little rodents you've ever seen (well, maybe next to a ferret or squirrel). They have bushy tails and big doe eyes. And, they are evil. We've posted about pack rats many times in the past. Here, here, here, and here just to reference a few of the times we've mentioned these vile creatures. They stink. They don't mind peeing in their own nest. And, that really stinks. There is no smell quite like the smell of pack rat pee. I hate it. Usually, they are worst in autumn as they prepare nests for winter hybernation. But, we encounter them all times of the year. And, the primary mission is to get rid of them and let them know they are not welcome at 100 Hidden Meadows Lane! This year is no exception. The first morning, or maybe it was the second morning after arriving, I looked under the hood of the Expedition (as is my morning habit) and sure enough, there was a pack rat nest on top of the engine. On a subsequent trip to Laramie, we got an error message in the truck "Trailer Wiring is Screwed Up" (or, something like that), and we weren't pulling a trailer. 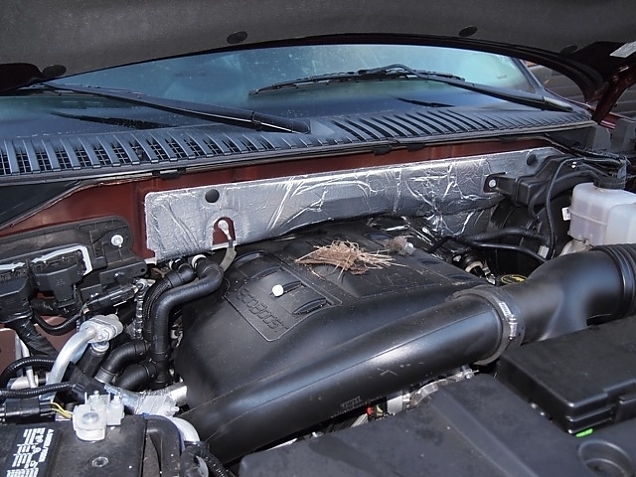 The rats like to get under the hood of a vehicle and make a nest in the possibly warm engine compartment. Here is an example of the beginnings of a nest under the hood of the Expedition one morning. On other mornings, a different nest was also adorned with insulation from the firewall in the truck. One morning there was some kind of grey foam insulation which source I cannot find. There was also a blue plastic cap for insulating the positive terminal of a battery--probaby from an ATV--again, no idea where it came from. This is a fairly long story, so I'll continue it in More... Please, click through.